Preheat oven to 200 degrees. Roughly chop up the wafers into smaller bits, melt the butter and let cool down. Mix flour with the sugar, vanilla sugar, salt and baking powder. Whisk butter, eggs and milk, then slowly stir in the rest of the flour mixture. Mix most of the coarsely chopped wafers by folding gently into the batter, but put a small handful aside. 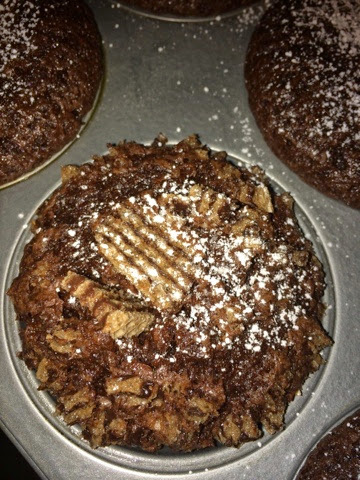 Place in paper baking cups onto a muffin tin and fill cups 1/2 full with batter. Add some extra wafer pieces on top of each - for a little extra crunch and chocolate! Bake at 200 degrees for about 20 minutes.